Many books on grief lay out a model to be followed, either for bereaved persons to live through or for professionals to practice, and usually follow some familiar prescriptions for what people should do to reach an accommodation with loss. The Crafting of Grief is different: it focuses on conversations that help people chart their own path through grief. Authors Hedtke and Winslade argue convincingly that therapists and counselors can support people more by helping them craft their own responses to bereavement rather than trying to squeeze experiences into a model. In the pages of this book, readers will learn how to develop lines of inquiry based on the concept of continuing bonds, and they’ll discover ways to use these ideas to help the bereaved craft stories that remember loved ones’ lives. "The Crafting of Grief is a refreshing alternative to conventional grief psychology. Furthering their ideas of re-membering conversations, Hedtke and Winslade discuss the work of Gilles Deleuze, Michael White, and the politics of grief, all which add richness to their already pioneering work. There are many practical ideas that counselors can incorporate including the crafting of aesthetic responses to loss and trauma. This book is a trailblazer, offering new possibilities and terrains to grief counseling." "This book is both intellectually adventurous and deeply moving. Hedtke and Winslade generate theory and demonstrate practice that take on the notion that grieving is merely a ‘natural’ process unfolding uniformly across all cultural contexts and all times in history. Their rigorous critical inquiry of time-worn ideas about bereavement opens up new possibilities for foregrounding the beauty in the grieving process, crafting a container for hope. In effect, this groundbreaking work ushers in an ‘aesthetic science’ of bereavement." "This is a spellbinding book, rich in conceptual content, ripe in personal wisdom, and robust in offering a bold new way to engage with those who have experienced the loss of someone close to them. We especially recommend the work for therapists, grief counselors, hospice volunteers, and indeed, all who help those who face death and dying." "Grief is the probably most painful thing we experience as part of everyday human life, and yet we lack creative ways to deal with it. Hedtke and Winslade’s book fills that gap completely. It manages to combine a thorough theoretical analysis of grief as a cultural experience with really accessible practical examples of therapeutic—even invigorating—conversations. Read—feast on the ideas—and have a go at the practice!" "After using my trusty yellow marker to underline passages that stood out, I ended up with a seriously yellow-looking manuscript. The quality and clarity of Hedtke and Winslade’s writing is astounding. In fact, there were passages in their book that brought me to tears (a first!). I was left viewing this wonderful book as both a powerful political document—one that will surely alter how we do counseling." "Crafted with both elegance and sensitivity, this book opens up and explores radical dimensions of living and dying, losing and grieving. Living and dying, losing and grieving become actions and events in the world that might be made at once both ordinary and reverent in the careful crafting of therapeutic conversation. Beautifully told practice illustrations interweave with sound theorizing to make this account a compassionate contribution to understandings and practices of mourning." 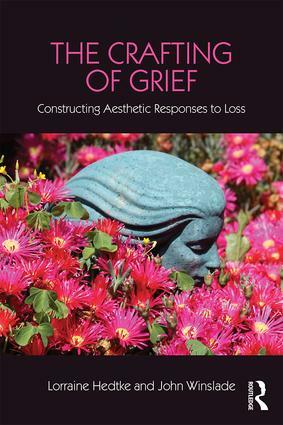 "Hedtke and Winslade invite a fresh approach for professionals to learn new practices for working with the aesthetics of grief and loss. The authors make a compelling case for a new practice of crafting responses to grief that leave families comforted, acknowledged, sustained, and even revitalized in the face of loss. This is an essential text for those seeking to respond to those with grief in deeply respectful and honoring ways." "I soaked up every word. I delighted in the perfect blend of writing that is poetic and renders the theory accessible, along with stories that bring people and therapeutic practices to life. So much of my copy is highlighted because it was all so valuable!" Lorraine Hedtke, MSW, LCSW, PhD, teaches about death and bereavement throughout the US and internationally. She is professor in counseling at California State University, San Bernardino, is on faculty at the Vancouver School of Narrative Therapy, and is an associate of the Taos Institute. John Winslade, PhD, is a professor in counseling at California State University, San Bernardino. He is the coauthor of eleven books on narrative counseling and conflict resolution with translations into six other languages. He is an associate of the Taos Institute.